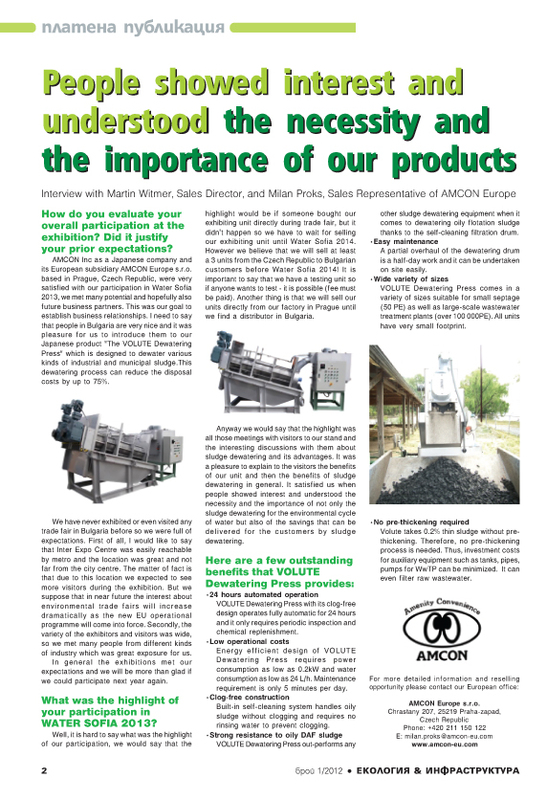 "People showed interest and understood the necessity and the importance of our products Interview with Martin Witmer, Sales Director, and Milan Proks, Sales Representative of AMCON Europe How do you evaluate your overall participation at the exhibition? Did it justify your prior expectations? AMCON Inc as a Japanese company and its European subsidiary AMCON Europe s.r.o. 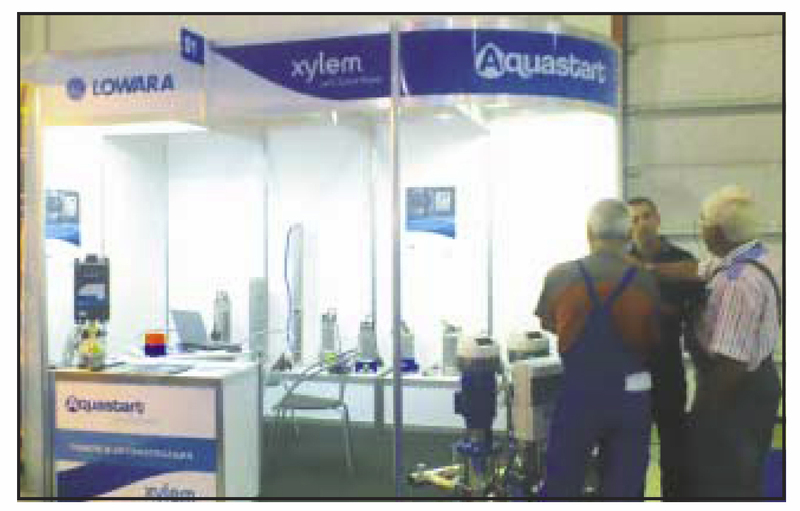 based in Prague, Czech Republic, were very satisfied with our participation in Water Sofia 2013, we met many potential and hopefully also future business partners. This was our goal to establish business relationships. I need to say that people in Bulgaria are very nice and it was pleasure for us to introduce them to our Japanese product “The VOLUTE Dewatering Press” which is designed to dewater various kinds of industrial and municipal sludge.This dewatering process can reduce the disposal costs by up to 75%. We have never exhibited or even visited any trade fair in Bulgaria before so we were full of expectations. First of all, I would like to say that Inter Expo Centre was easily reachable by metro and the location was great and not far from the city centre. The matter of fact is that due to this location we expected to see more visitors during the exhibition. But we suppose that in near future the interest about environmental trade fairs will increase dramatically as the new EU operational programme will come into force. Secondly, the variety of the exhibitors and visitors was wide, so we met many people from different kind of industry which was great exposure for us. In general the exhibitions met our expectations and we will be more than glad if we could participate next year again. What was the highlight of your participation in WATER SOFIA 2013? Well, it is hard to say what was the highlight of our participation, we would say that the highlight would be if someone bought our exhibiting unit directly during trade fair, but it didn’t happen so we have to wait for selling our exhibiting unit until Water Sofia 2014. However we believe that we will sell at least a 3 units from the Czech Republic to Bulgarian customers before Water Sofia2014! It is important to say that we have a testing unit so if anyone wants to test – it is possible (fee must be paid). Another thing is that we will sell our units directly from our factory in Prague until we find a distributor in Bulgaria. Anyway we would say that the highlight was all those meetings with visitors to our stand and the interesting discussions with them about sludge dewatering and its advantages. It was a pleasure to explain to the visitors the benefits of our unit and then the benefits of sludge dewatering in general. It satisfied us when people showed interest and understood the necessity and the importance of not only the sludge dewatering for the environmental cycle of water but also of the savings that can be delivered for the customers by sludge dewatering. Here are a few outstanding benefits that VOLUTE Dewatering Press provides: 24 hours automated operation VOLUTE Dewatering Press with its clog-free design operates fully automatic for 24 hours and it only requires periodic inspection and chemical replenishment. Low operational costs Energy efficient design of VOLUTE Dewatering Press requires power consumption as low as 0.2kW and water consumption as low as 24 L/h. Maintenance requirement is only 5 minutes per day. Clog-free construction Built-in self-cleaning system handles oily sludge without clogging and requires no rinsing water to prevent clogging. 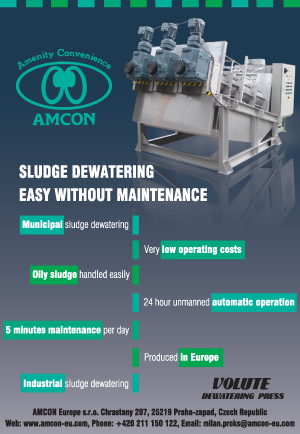 Strong resistance to oily DAF sludge VOLUTE Dewatering Press out-performs any other sludge dewatering equipment when it comes to dewatering oily flotation sludge thanks to the self-cleaning filtration drum. Easy maintenance A partial overhaul of the dewatering drum is a half-day work and it can be undertaken on site easily. Wide variety of sizes VOLUTE Dewatering Press comes in a variety of sizes suitable for small septage (50 PE) as well as large-scale wastewater treatment plants (over 100 000PE). All units have very small footprint. No pre-thickening required Volute takes 0.2% thin sludge without pre-thickening. Therefore, no pre-thickening process is needed. Thus, investment costs for auxiliary equipment such as tanks, pipes, pumps for WwTP can be minimized. It can even filter raw wastewater. 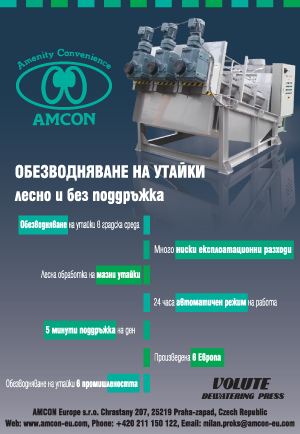 For more detailed information and reselling opportunity please contact our European office: Address: AMCON Europe s.r.o. Chrastany 207, 25219 Praha-zapad, Czech Republic Web: http://www.amcon-eu.com Phone: +420 211 150 122 Email: milan.proks@amcon-eu.com "